LAFM TV 13th Season! Episode 3! September 26, 2018	Comments Off on LAFM TV 13th Season! Episode 3! Check out this week's show, which features three Louisiana coaching legends, the head football coach at Northwestern State University, a upcoming big time recruit from John Ehret High School, and also we have some rare vintage highlights of the late LSU legend Billy Cannon when he was at Istrouma High School so what are you waiting for and stay tuned to LAFM TV! This week, Louisiana Football Magazine's staff each covered a couple of teams and caught up with some of the coaches and players to see what is going on with the teams featured above in terms of recruiting, offers, visits, and much more! Louisiana Football Magazine Now Has a Youtube Channel! September 20, 2018	Comments Off on Louisiana Football Magazine Now Has a Youtube Channel! We have great news that Louisiana Football Magazine now has an official Youtube page. For more information, please click the link above in order to subscribe! LAFM TV 13th Season! Episode 2! September 19, 2018	Comments Off on LAFM TV 13th Season! Episode 2! Check out our Week 3 game recap of Zachary High School and Madison Prep Academy. Check out today's prep team spotlight on the Baker Buffaloes as they get ready to try and improve on their 1-1 start against McKinley this week! 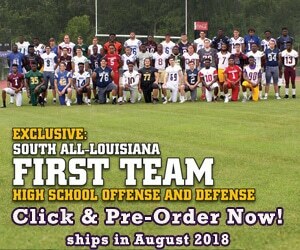 Our 13th season of Louisiana Football T.V. Magazine kicks off this week! We have a huge guest coming in studio and it is a great show to start the season off. Click the link to check out how you can see the show in your area!